A carriage added to a train in addition to its usual formation due to high demand. Spot-on ed. The NERA's publication of the LNER NE Area 1926 carriage roster shows many consists being strengthened at various points during their daily work. Sometimes these additional coaches are only added for short spells and others are added for most of the day. While the timetable itself was a complicated process there must have been a significant process at work to balance out strengthener carriage movements. Most additions and removals were carried out at major stations such as York, Hull, Leeds, Carlisle and Newcastle but not all. Last edited by borderreiver; January 19th, 2019 at 04:18 AM. I am just adjusting my Harrogate, Knaresborough schedule to the LNER NE Area 1926 carriage roster and there are four instances of a XB being added to the Twin Autocar Set 342. This provided 16 firsts, 100 thirds with the addition of the XB with I believe an additional 40 Thirds. I see that set 342 gained an XB at Harrogate on the 2pm departure and on the 4:34 pm departure from Knaresborough on Wednesdays Only. The 4:34 pm from Knaresborough then forms the 5:15 pm from Harrogate with the extra XB and then the 5:45 pm working from Knaresborough. An XB is a 52ft Ordinary Brake Third, giving between 30 and 60 extra Third Class seats (3, 4, 5 or 6 compartment 52ft Brake Third). The carriage roster sometimes does what it is doing here for set 342, that is giving no information on when the XB was removed. While the above departures had an asterisk indicating the presence of the XB there is no entry for when or where it was removed. Being a stickler would have it removed at Knaresborough at 2:10 pm, since there is no asterisk for the 2:18 pm departure to Harrogate. It would then seem to lay over until attached to the rear of the 4:34 pm from Knaresborough to Harrogate. The eight minutes until the 2:18 pm departure for Harrogate would be just about enough time to run through the tunnel to Knaresborough Junction, deposit the XB in a siding and then run in to the Harrogate bound platform. The 4:25 pm arrival from Harrogate gives just 9 minutes to recover the XB from its siding and be back in the Harrogate platform for 4:34 pm. The 5:45 pm from Knaresborough gets back to Harrogate at 5:56 pm, where I presume the XB was finally removed and returned as empty coaching stock (ecs) to Starbeck. I doubt that the station yard at Knaresborough justified a shunter there on a daily basis but perhaps Starbeck put one there on Wednesdays between 2 pm and 4:30 pm. Alternatively another train locomotive acted as a station pilot. The 1917 Road Wagon schedule for the Starbeck Road Wagons shows wagons 242 & 391 served Knaresborough inwards to Starbeck and 241 & 392 served Knaresborough station outwards. Wagon 339 also gave connections. Wagon 241 departed York for Starbeck at 9am, while wagon 242 departed Starbeck for York at 1:20 pm. It is possible that the locomotive working the 1:20 pm pickup goods for York was booked to be at Knaresborough around 2:10 pm on Wednesdays. It could have removed the XB from the 2 pm steam autocar departure from Harrogate (or recover the XB from the York bound platform road after the autocar uncoupled it and left it there while it ran on to the trailing crossover at Knaresborough junction). Wagon 391 departed Starbeck for Brafferton on the Boroughbridge branch (via Pilmoor on the East Coast Main Line) at 9:10 am on the Boroughbridge branch pickup goods and wagon 392 departed Brafferton for Starbeck at 12:30 pm, so again it is possible that the locomotive working the 12:30 pm for Starbeck could have been at Knaresborough around 2:10 pm. Wagon 339 was a Hull Road wagon with a daily working to Starbeck. However, it was attached to the 9 a.m. York to Starbeck pickup goods train. It is listed on Mondays Only departing Knaresborough on alternate Mondays at 4:15 pm or 5:20 pm for Starbeck. It is not listed in the schedule how the wagon returned to Hull, via York or via Leeds. 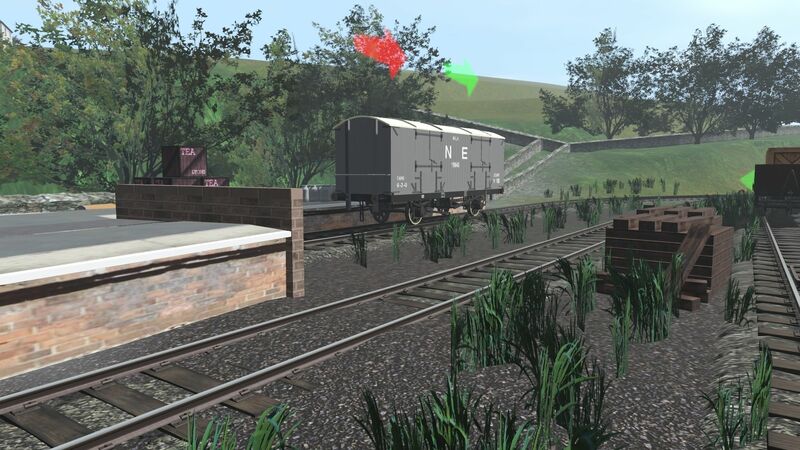 It is entirely possible that Starbeck shed or York shed had a duty placing a tender goods locomotive at Starbeck at 2:10 pm and 4:25 pm on a Wednesday. If it was a C class/J21 class 0-6-0 then a brake fitted locomotive (the class had several so equipped) would have suited for the ecs work at Knaresborough with the XB. 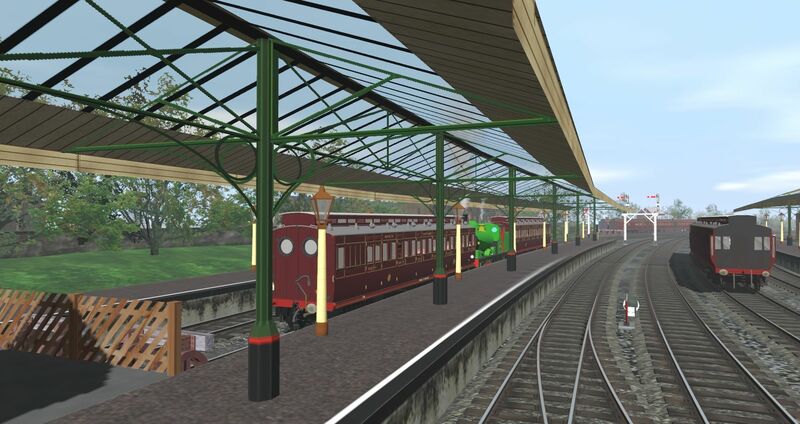 Just my opinion there though, since I do not have a working timetable for the station or a duty roster for Starbeck or York sheds. Last edited by borderreiver; January 19th, 2019 at 04:28 AM. As always a compendium of knowledge, I am slowly working through the schedule and appreciate your suggestions. Am away for a week or so, will review when I return home. 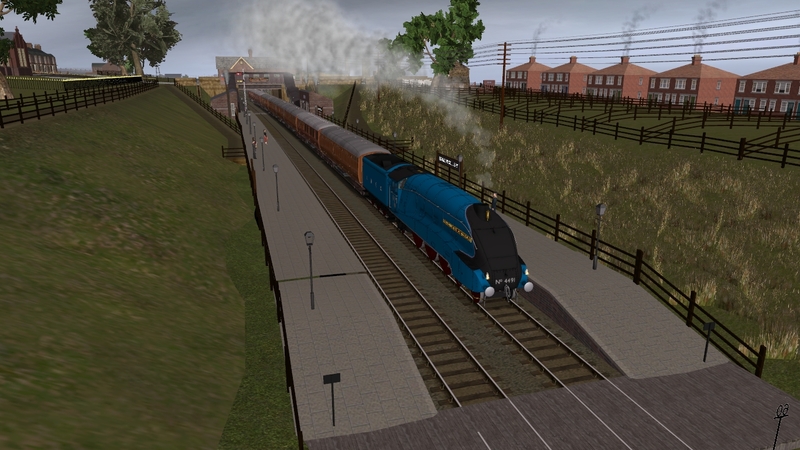 Northeast England during the steam era. The locals called the local passenger service from Durham to Bishop Auckland "The Brandon Bus". Here, Brandon Colliery station on the Durham to Bishop Auckland branch sees the arrival of the 5:20 p.m. local passenger from Durham bound for Bishop Auckland, where it arrives at 5:40 p.m. This is a Monday, since 1926 Carriage Roster showed that this roster, Number 86, required a "WT" strengthening carriage to be added to the twin autocar for this Durham to Bishop Auckland leg of its journey on Mondays Only. On Saturdays Only it would have two additional "WT" strengthening carriages added at Sunderland at 4:05 p.m. The G6 0-4-4T, a Fletcher design, was almost fifty years old at this point it would still have around four years of service left in it. It was quite capable of handling four coach trains. The code "WT" indicates a Third Class coach of either 45ft, 49ft or 52ft could be added, as available. 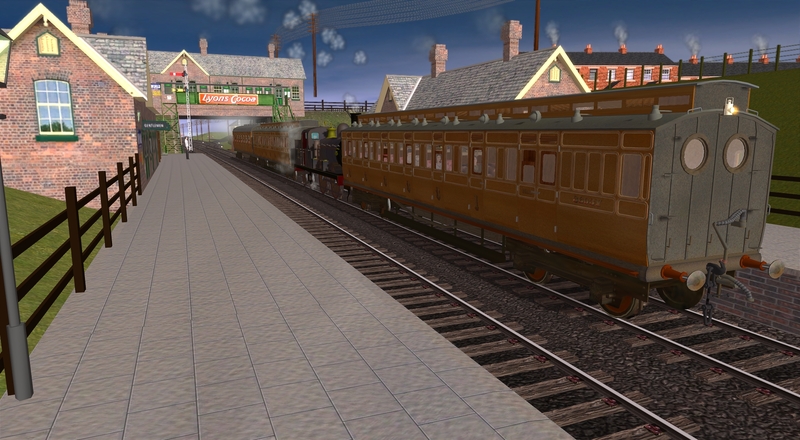 If a 52ft Third Class carriage was required it would be shown as "XT" while a 49ft carriage would be "YT". The much rarer 45ft Third Class carriage would be "ZT". A six-wheel strengthening Third Class carriage would be coded as "T". Roster number 86 was assigned to a twin autocar and started its day at Tatham Street, Sunderland at 12:33 p.m. It would finish its day back at Tatham Street at 8:38 p.m. It would run from Sunderland to South Dock, back to Sunderland, then to Durham. After returning to Sunderland from Durham it would leave Sunderland at 4:05 p.m for this journey to Bishop Auckland via Durham. After a short stay at Bishop Auckland it would go on to Barnard Castle. 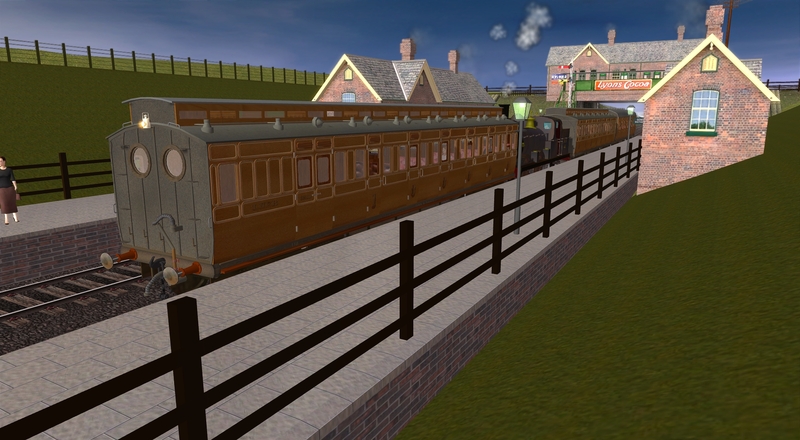 Leaving Barnard Castle at 6:45 p.m. it would run all the way back to Sunderland, arriving at 7:48 p.m. After one final trip to South Dock and return, the twin autocar would stable at Tatham Street. This area is having some upgrades and modernisations doing so it is a work in progress. Last edited by borderreiver; January 29th, 2019 at 05:03 PM. A very interesting post as always Frank. 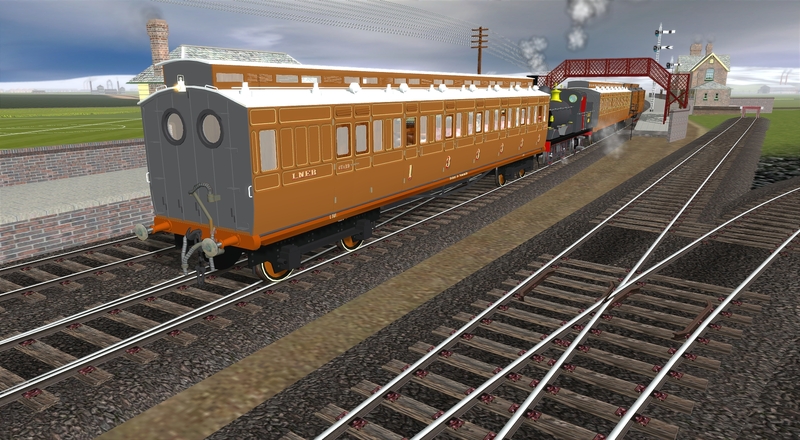 I'm trying to keep a lid on my Trainz purchases, but that autocar coach is sorely tempting me at the moment. Thanks borderreiver for the info, always a 'good read' on this most interesting thread. Looking good Jack. Is that Harrogate on your route, with the steam autocar waiting to depart with the shuttle for Knaresborough? Yes, I posted too quick to add a description as I have visitors who distracted me. Hope that you do not mind crashing you topic. I have just received my first Milk Van from Barn700, another one to follow shortly. 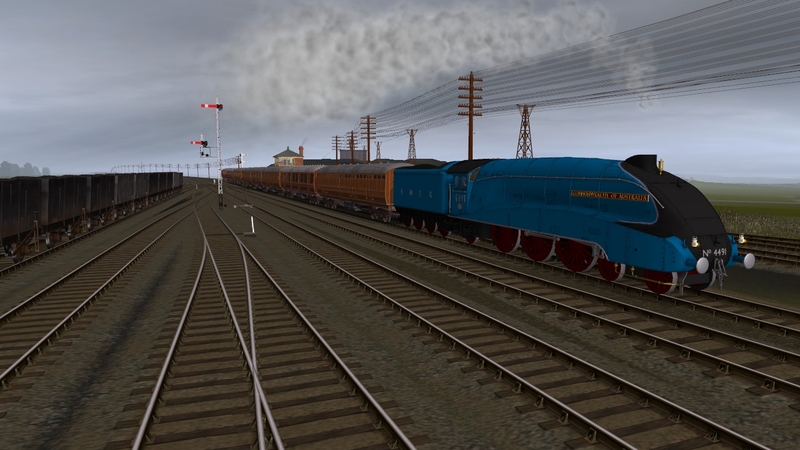 Northeast England during the steam era. 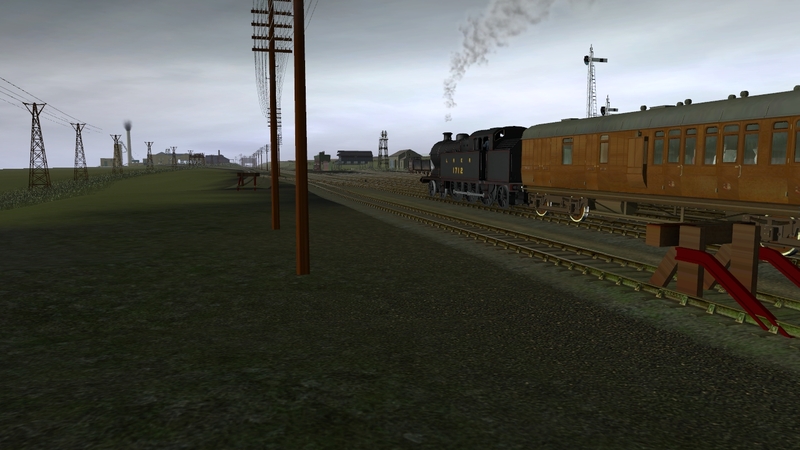 1937 on the Bishop Auckland branch to the north of Brandon Colliery station. A LNER A5 4-6-2T heading towards Bishop Auckland. The derelict Brandon "A" Pit can be seen just in front of the loco. While the colliery was closed around WWI its exchange sidings remained in use for marshalling some traffic from Brandon "C" pit, the larger colliery to the left of shot. A colliery shed was located in the yard at the old Brandon A pit and provided the motive power for both the "C" pit and the new Brandon Pithouse Colliery to the west. This was sunk in 1924, producing coal from 1927. Situated at 750ft above sea level, the Pithouse colliery was quite remote and miners housing was never built on site. Miners had to travel from Brandon, Meadowfield and Langley Moor. At first a miners train ran at shift changes from the old "A" Pit yard, but this stopped by 1943. My guess is that the mine owners then provided a bus service, though it was probably an older vehicle or older vehicles, since pithead baths tended to be a post-WWII amenity. Both Brandon "C" and Brandon Pithouse closed during the late 1960s. The NCB spent half a million pounds modernising Brandon Pithouse between 1957 and 1960, only for them to close it seven years later. Around the same time as modernisation finished, 0-6-0 diesel shunters took over the work on the waggonway. The morning empties heading up the waggonway to Brandon Pithouse Colliery. Grades as steep as 1 in 18 await the train. Nine 20T hoppers were the limit for empties but a single loco would take time to bring nine loaded hoppers back down as the descending load was limited to three 20T hoppers per locomotive. I have decided to send three 0-6-0T locomotives up, since Meadowfield shed had enough locos allocated there to spare three for Pithouse. A descent at 10 mph would take fifteen minutes. Two road crossings on the way would have to be crossed at 4 mph, probably extending that to around twenty minutes. This would mean the third loco could commence descent around forty minutes to an hour after the first loco left Pithouse with its three loaded hoppers. Time was critical since there was an additional complication, caused by the lack of a water tanks and water crane at Pithouse. This meant a close eye had to be kept on locomotive water levels when up on site! Woe betide the fireman who did not leave the "A" Pit yard at Meadowfield with full water tanks! The crossing at the bottom of Commercial Street where it became Brandon Road. Anyone passing this spot today will have a hard time believing that there was ever a railway here. Brandon Cricket Club and its ground occupies the site of "A" Pit Meadowfield yard and the trackbed of the Bishop Auckland branch. Another excellent informative post Frank. Your explanations of historical events and methods of working are very readable. 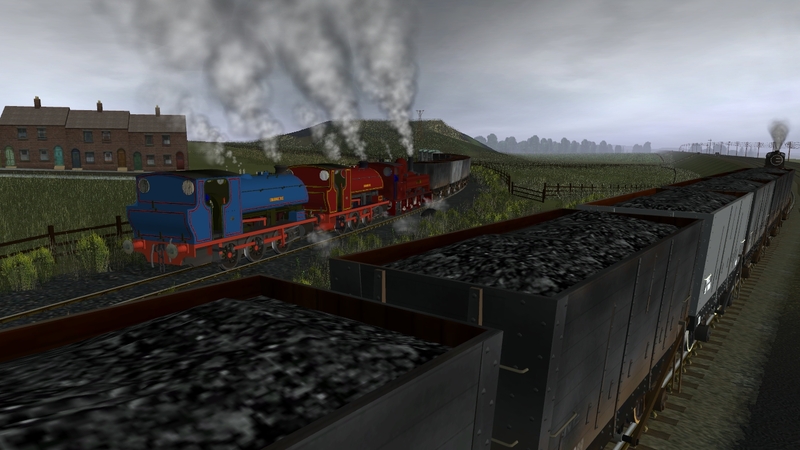 Northeast England during the steam era. The summer of 1939 on the LNER NE Area around Brandon Colliery to the southwest of Durham. I have been working on my NW Durham route and upgrading stuff in this district. A J27 heads past Brandon "C" Pit, heading south west towards Bishop Auckland with a loaded coal train diverted from the Leamside line due to engineering works in the vicinity of Ferryhill. 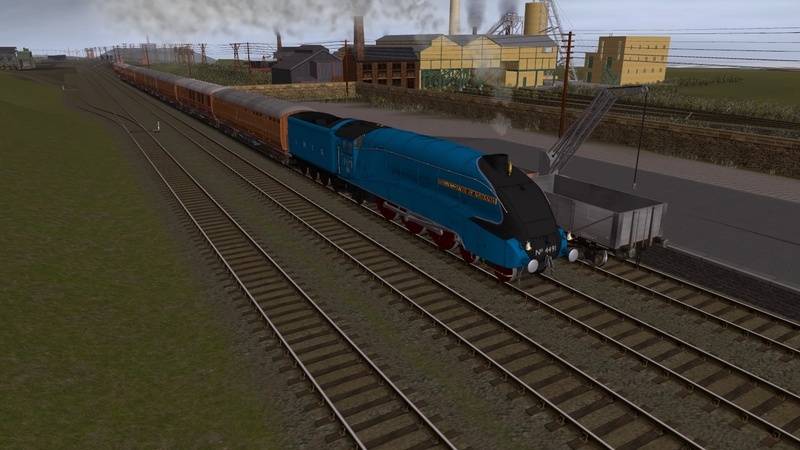 A4 "Commonwealth of Australia" heads a diverted Up ECML express for Kings Cross past the Brandon "C" Pit exchange sidings. The A4 passing Brandon "C" Pit and Brandon Colliery station yard. The A4 runs through Brandon Colliery station. 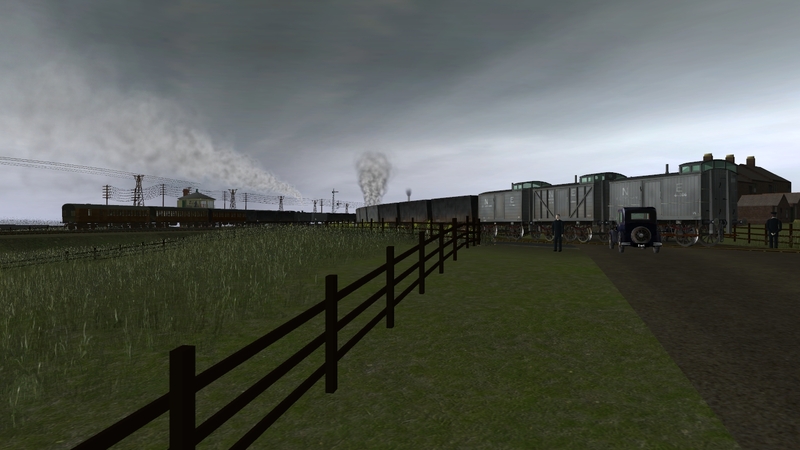 The train will rejoin the ECML at Darlington.